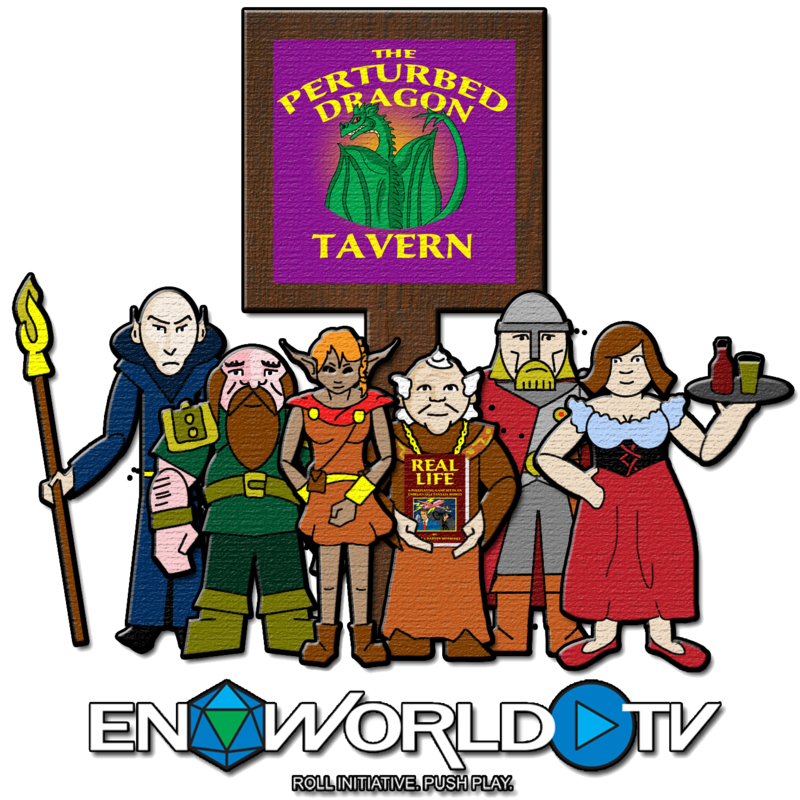 The Perturbed Dragon An original animated show from EN World TV! Battle of the Bards – FINAL! “Now I’ve made a whole load of cartoons in the past, but this was probably the most complicated one yet. First we had to come up with a compelling concept. When we started, all Russ knew was that he wanted six episodes of a Dungeons and Dragons related cartoon. The first idea we (by which I mean Russ) came up with was to sit four gamers around a table, playing D&D and making in-jokes about it. But that didn’t really grab me. It felt like something that had been done before, and probably better than we could. So we turned it on it’s head. What if we had four fantasy characters sitting around playing a game of Real Life. That’s when our imaginations started running riot. You wouldn’t just be limited to jokes about nerds and D&D cliches, but you could actually have proper social commentary on real life issues as well! Wait, did I say ‘social commentary’? I meant lame jokes, obviously. Duh. I worked up some notes and designs for the characters. Russ made me redo them about four million times, coming up with useful changes and suggestions. 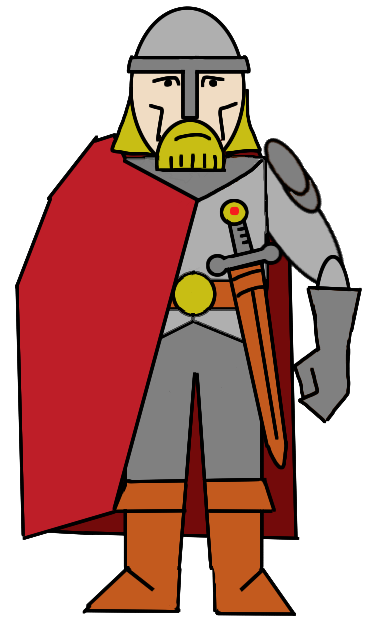 Erric the knight, for example. My initial drawing of him is on the left. As Russ pointed out, he looks more like a wannabe guard than a noble adventurer. So then we decided to work that into his character. Now Erric is, indeed a noble knight, however he also has a ‘twin brother’ in the local militia. No one has ever seen them together. After his revision, Erric looks like the picture on the right. The other characters went through similar reworks – Malach, may well be an uber-powerful wizard in hiding. Bilar the dwarf has a secret that he doesn’t want anyone else to know – let’s just say that he’s probably over-compensating for something! Sheenah the barmaid was a late addition. She’s only working in the bar to pay for her tuition! The point was to take cliched fantasy characters and put a spin on them that made them a bit more interesting and, hopefully like nothing you’ve seen before! The next stage was to get some voices for the characters. After all, it would be silly if I did all the voices. They’d end up all sounding the same. But we also knew that we wouldn’t be able to get all the different voices we needed into a studio at the same time. Studio? Hah. We were doing this on practically no budget! We decided to see whether we could do it all on-line. There must be plenty of people out there with half decent recording equipment and most of them will have voices, right? They could record it at home and e-mail it in to us. Then I could assemble all of the voice clips into a coherent whole. We put together a short sample script and then Russ put out a casting call. We expected a little bit of interest. Maybe twenty or thirty auditions, if we were lucky. We got over a hundred. Apparently there’s a lot of people out there who want their shot at fame, even if it’s only through the medium of cartoon! Even I put in an audition! We had to listen to every single one of them. We’ve both agreed that if we ever have to listen to those lines again, we might just give in and drink the Kool-Aid. Some of them were easily dismissed because of terrible performances or awful sound quality. The rest was not so easy. After a week of listening and choosing and changing our minds and arguing over who was best (me, obviously! ), we eventually settled on our cast. From left to right: Malach (Me! ), Bilar (M. Darin Young), Dee (Melody Mooney), Duncan (George Ledoux), Erric (Joe Gawronski-Salerno) and Sheenah (Karen Bogen). At this point, we pretty much had a recorded script. Not wanting to waste it, we decided that we would turn it into an introductory mini-episode. So I had to draw it and animate it. And draw it and animate it, I did. That was a lot of drawing and animating! But once the drawing and animating was done, I had templates for future episodes. 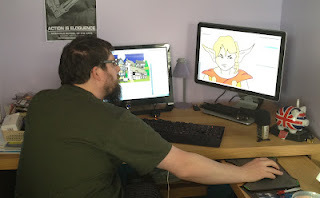 Hopefully there will be less drawing and animating to do for the remaining six episodes! Before you ask… no I didn’t comb my hair for the photo. While I was busy doing that, Russ amused himself with the fun stuff – contract negotiations and the like. We even had a theme tune provided by my longtime collaborator, Jon Steadman. 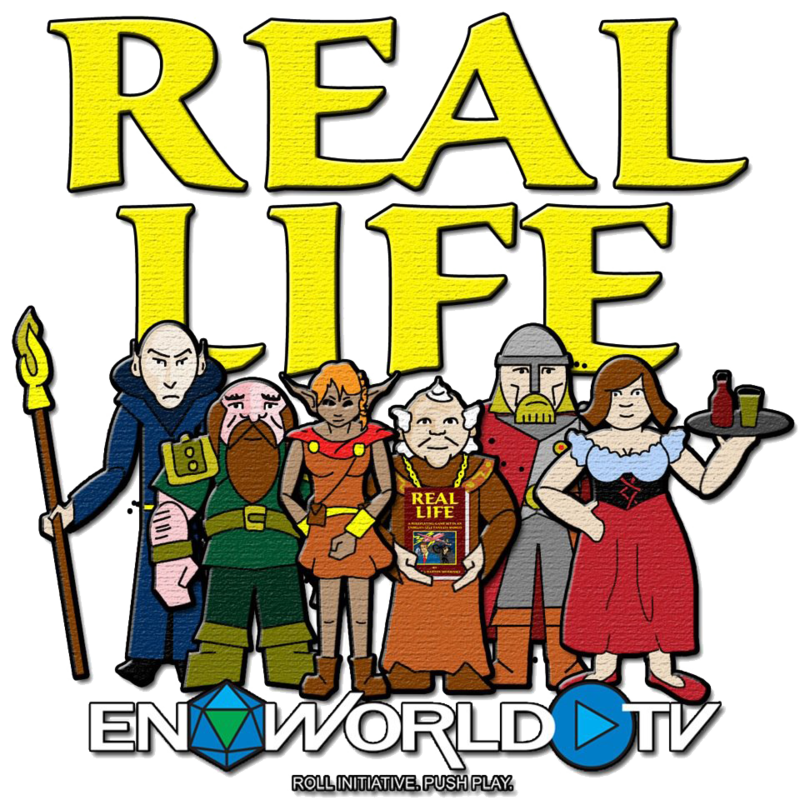 As mentioned above, we had decided to use the name of the role-playing game as the title of the series: ‘Real Life’. 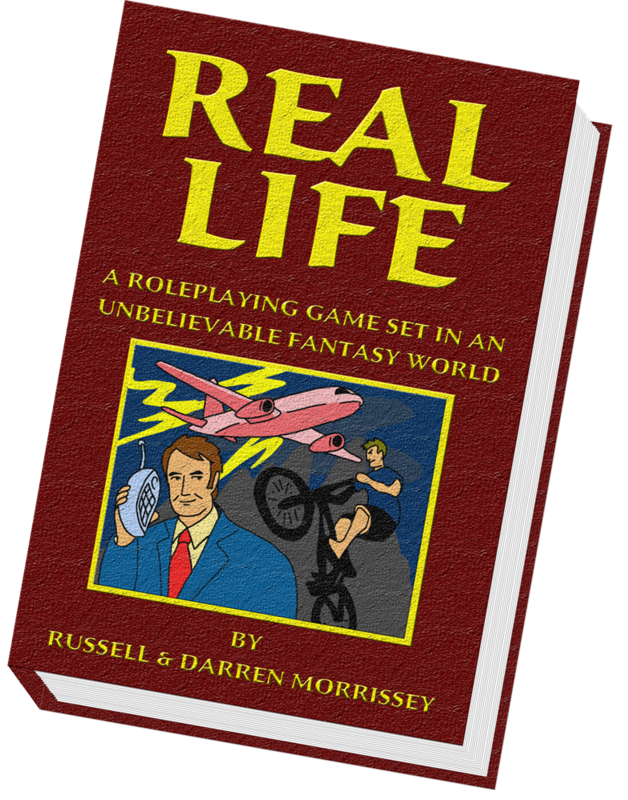 Shortly after Russ started to do a bit of publicity, he discovered that there was already a web-comic out there called ‘Real Life’. We didn’t want to upset anyone, so we decided to change the name. Well that started a week of agony, trying to pick an alternative. We tried pretty much everything on to see if it would fit. Variations on the original title like ‘Playing Real Life’ or ‘Real Life Adventures’. Nothing really floated our boat. Then it occurred to us that we had the perfect title sitting just outside the Tavern in which our heroes were gaming. The name of the tavern: ‘The Perturbed Dragon’! And that’s pretty much it. The genesis of ‘The Perturbed Dragon’. Also a potted history of the last month or so of my life – well, the bits of it when I wasn’t at my day job, anyway!